Keezer (Definition) noun: A freezer/keg combination. 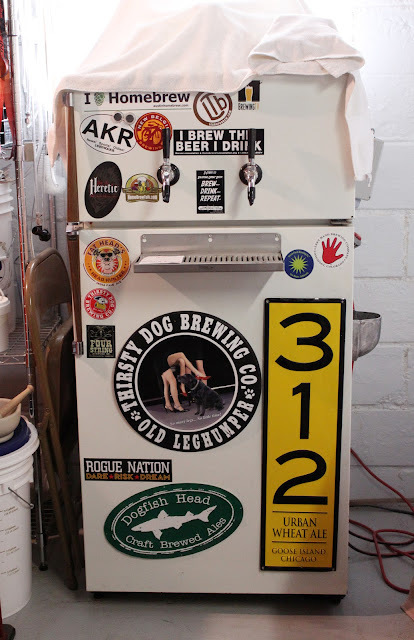 A freezer that has been modified to serve beer. See also: kegerator. These are the types of things I learn everyday living with Mike. 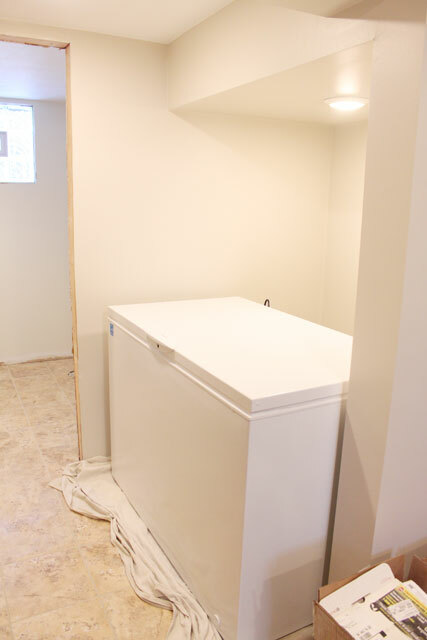 I've explained before that we had two keezers already in the basement, (technically one was a kegerator, as it is a refrigerator/keg combination), but realized it would be best to sell them and buy one large freezer in order to utilize the nook space. Since we were in the process of cleaning out the laundry room I decided to check out the pricing for chest freezers. My thought being to buy and move the new one into position and then take these two straight out to the garage to sell. One of my biggest issues with this project is the constant moving things into one spot, then moving it back, only to move it somewhere else in the end. 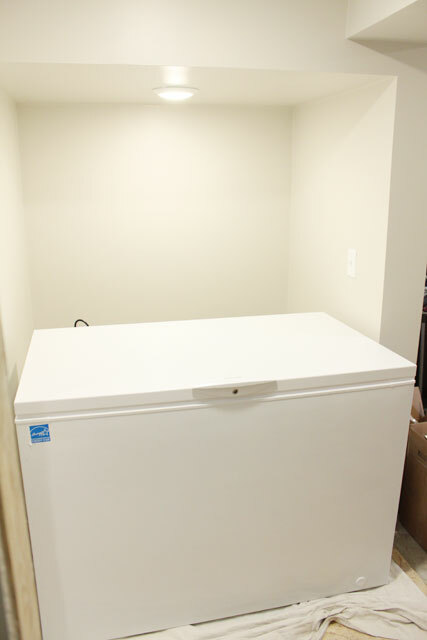 I found a freezer the size we needed on sale at Best Buy and convinced Mike to stop by during a trip to Home Depot. We weren't planning to buy it, (isn't that what they always say), but decided we might as well once we got there. The price was $399, marked down from $560. We thought it was a pretty good price. That's until the sales woman said that it was "mis-marked because they no longer had them in stock." She said she would honor the price on a similar model or we could get the floor model for an even deeper discounted price. I try not to seem too overly excited when someone tells me awesome news so I kinda looked at Mike like "Ehh, I'm not sure about this." But, secretly inside both Mike and I were jumping up an down. The floor model was in great shape and she ended up giving us 30% off the sale price, for the final price of $299. That's 47% off the original price! So obviously, we loaded it up right there and went home instead of finishing our errands. 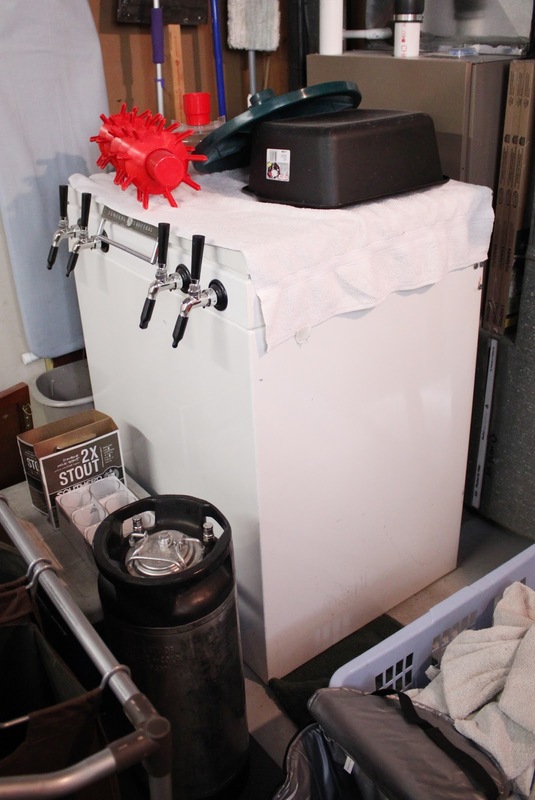 After removing all the things from the laundry room, we hauled the old keezers up to the garage and the new one, (which is still just a freezer before Mike does his magic), downstairs to it's new home in the beer cave. (Although it's not pushed in all the way, so when were done, it won't stick out that much). Since I didn't take any pictures of the painted walls before, you're getting a double treat! The pictures were looking a little peachy so I fixed my white balance and this is a more accurate color of the walls. The freezer has a couple inches on each side and fits perfectly, (it was designed that way). And we didn't push it all the back into place because we have to remove it to add the trim along the wall. 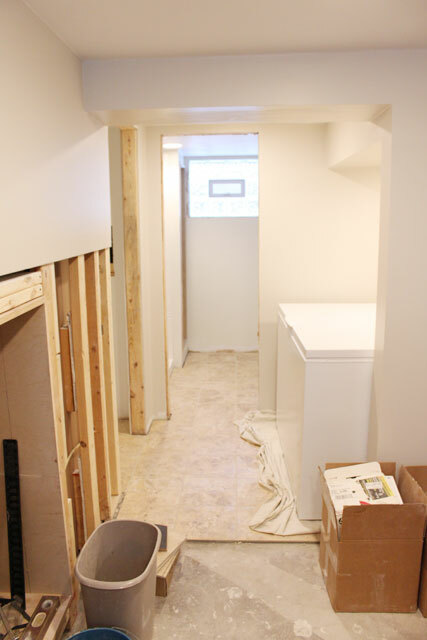 We'll do all the trim together so we're waiting until after the floor in the family room is done. I've already got ideas of how to make this little cave more beer-rific and Mike's already planning on converting this bad boy to a bonafide keezer.